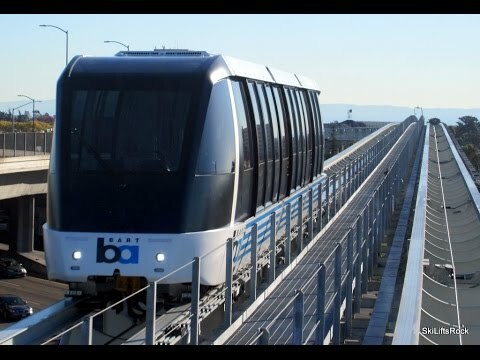 The BART-Oakland airport connector has been in operation for 6 months. And now that we are entering the peak summer flying season, it is a good opportunity to look at actual ridership numbers. For the month of June, the average weekday daily ridership was 3,231 entries and exits. The month of May had similar ridership (3,203 entries and exits). In its final ridership study (to obtain grant funding) BART had predicted OAC ridership to be in the range of 3,260-3,940 in the year 2015. That number was later revised downward to 2,685. The OAC replaced the AirBART bus service. The baseline bus ridership was 2100, although ten years ago it was much higher (around 3500 average weekday trips). This gives (at best) a net gain in transit ridership of 1,000 daily trips — a dismal result for a capital project costing $500 million. LAS VEGAS – July 1, 2015) — The Green Parking Council (GPC) today announced the first seven parking facilities in the U.S. to achieve Green Garage Certification, a comprehensive sustainability standard for existing and new parking facilities evaluating 48 elements of garage operation, programs, structure, and technology. The Green Garage Certification program will be delivered and promoted globally by the Green Business Certification, Inc., the certification body for the U.S. Green Building Council’s global LEED® green building rating system. Silver Spring Metro Plaza – parking garage built at a Washington Metro “intermodal” station. Bank of America Plaza – situated in downtown Los Angeles, near several Metro stops, and dozens of bus lines. 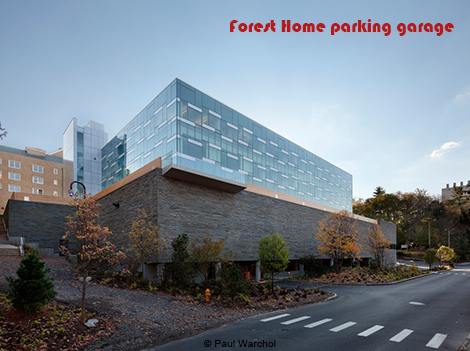 Westpark Corporate Center – another facility near the Washington Metro, and located in a Tysons neighborhood that certainly doesn’t lack for parking. The Essential Air Service subsidy, a relic of airline deregulation in the 1970’s, will apparently go on. Congressman McClintock tried to cut $155 million from the program with an amendment to H.R. 2577 (Transportation, Housing & Urban Development Appropriations Act). His amendment was defeated by a vote of 166 to 255, with 173 Democrats and 82 Republicans voting against. The waiting area was mostly empty, which is not surprising as the service just started. The gas tax is a perfect method to charge for the impact of motor vehicles. Heavier, gas-guzzling vehicles pay more, while more fuel-efficient vehicles pay less. Electric cars pay nothing, serving as an incentive to switch away from fossil fuels. And there is no complex technology required to collect the gas tax. There is also growing concern about the cost of the program. OReGO vendors will collect up to 40 cents of every dollar drivers are charged, and green car drivers could be in for some serious sticker shock every month. If the 40% figure is correct, then that is quite a scam. Almost half the money would go to private firms, instead of paying for road maintenance or other transportation programs. 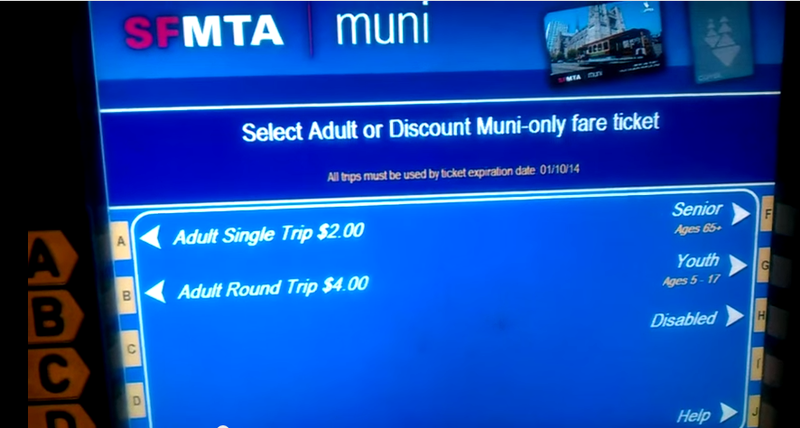 Why is it so complicated for kids and seniors to purchase BART tickets? If you go to a train station to ride the train, then you should be able to purchase a ticket right there at the station. I would think that is a self-evident. And if you are eligible for a special fare discount, such as a senior or youth, then you should be able to purchase a discount pass at the station. I would think that is also self-evident. 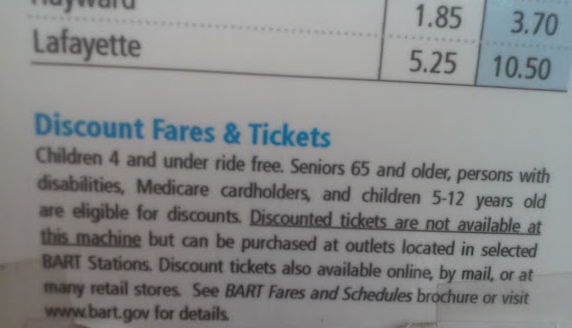 This is standard practice for almost any transit operator — except BART: This sticker is plastered to BART ticket fare machines — informing parents and seniors that they can’t buy discount train tickets at the station. 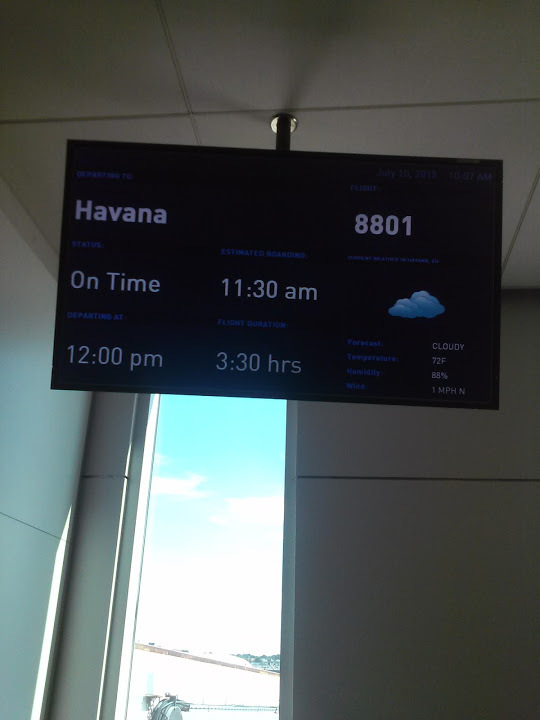 Instead, one must either take time off from work to schlep down to a Clipper service center, or else fill out an “application“, mail it in along with a government ID — and then wait for 7 days for your train ticket to arrive by mail. Here we are in the technological center of the universe, where BART has spent tens of millions of dollars on ticket vending machines (not counting the hundreds of millions of dollars the MTC has spent on Clipper “smart” card technology). And yet something as simple as buying a discount kids or senior pass requires an application, identification check, and as much as 7 business days of processing. And for what — to make sure your kids aren’t on a terrorist watch list?